Product #17425 | SKU RF-X | 0.0 (no ratings yet) Thanks for your rating! The RF-X Reflection Filter from sE Electronics prevents unwanted audio ambience from contaminating your vocal tracks in untreated acoustic environments. This acoustic filter uses the same patented technology as the RF-Pro. Its lightweight body and clamp assembly makes the RF-X simple and easy to use. The RF-X is lighter than its predecessors, but still maintains durability. It features a four-layer acoustic filter design comprising the outer composite panel itself, a wool fabric layer, an air gap layer and an inner acoustic foam layer. The air gap ensures that recordings exhibit almost no sound coloration when the RF-X filter is used. The RF-X clamp assembly's lightweight design can be used on almost any microphone stand. 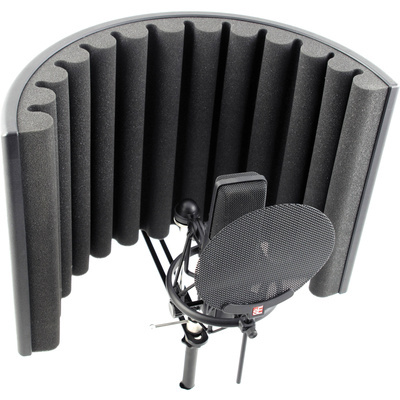 It allows vertical mounting only, making it ideal for vocal recording.